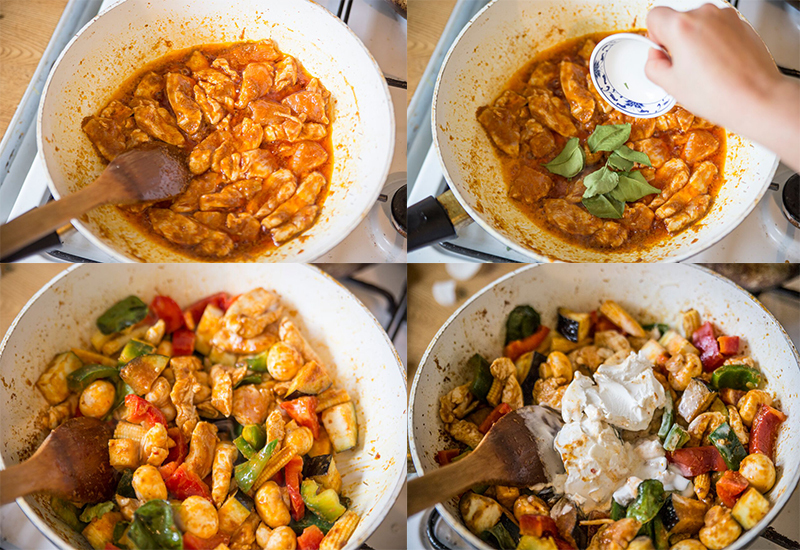 Cooking with Vân : Thai red curry ( serve 4). 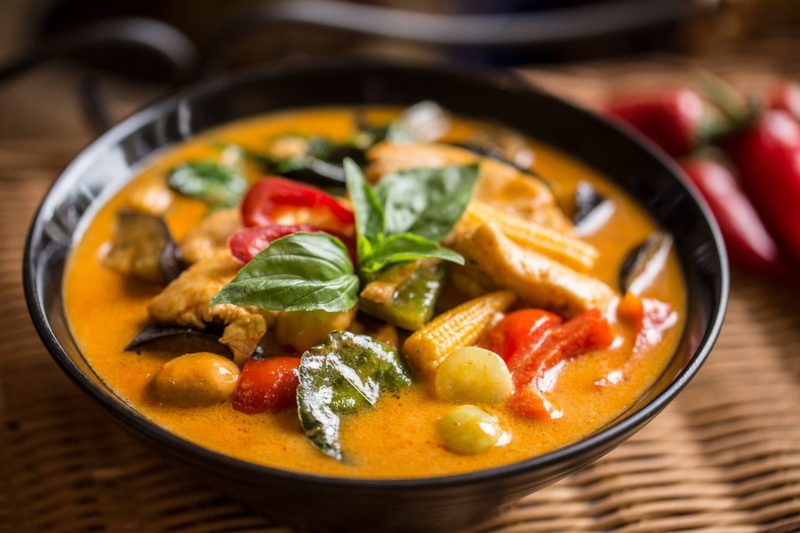 I visited Thailand few times and I had taste the freshly made Thai curry with wonderful aroma from local ingredients. 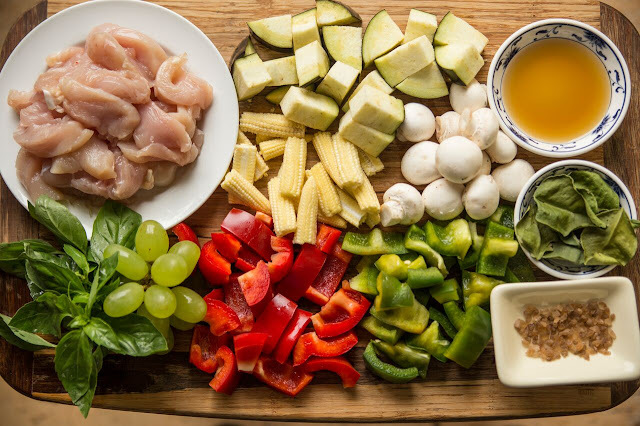 Thai curry paste is made from pounding a combination of fresh herbs: fresh lemongrass, fresh galangal, kaffir lime leaves, kaffir lime peels, shallots, dried and fresh chili, shrimp paste. 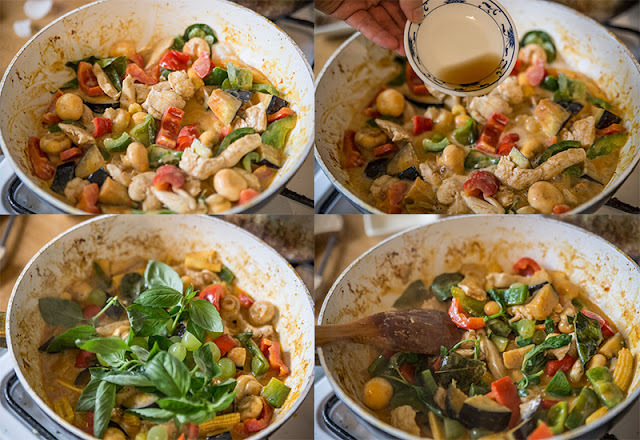 I won't attempt to recreate that curry paste because the ingredients are not available here in Ireland and the paste from the jar pretty close to the authentic Thai curry paste I had in Thailand. 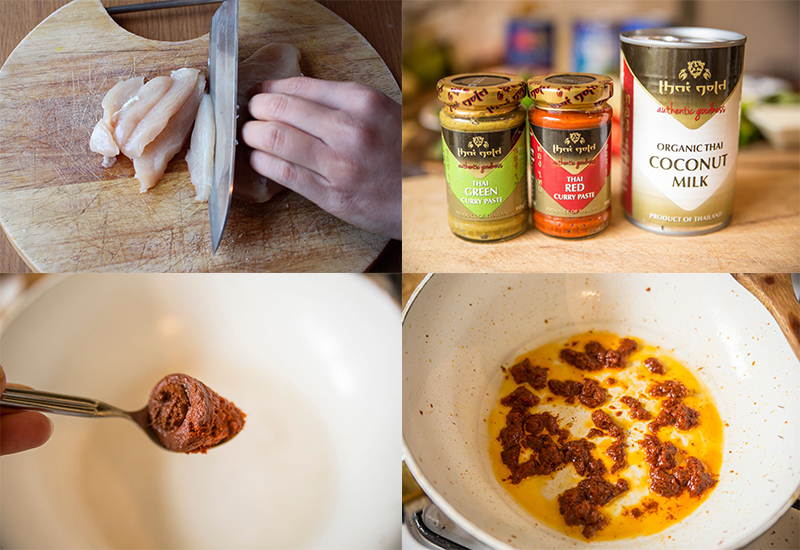 This recipe uses all the ingredients you can find easily in most supermarkets and the tricky part is finding the right Thai curry paste. 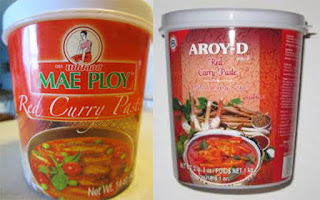 Other wise you will collect the wrong curry paste and the dish won't turn out as desired. 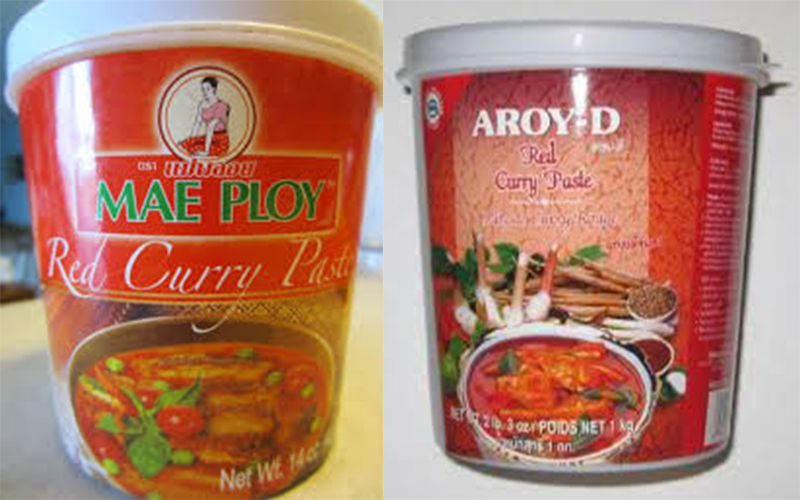 You can find so many brands out there claiming to be curry paste but there are few of them are authentic like : Meaploy and ARoy-D are in big plastic box for 400gr, Thai Gold and few other brands are in very small jar for around 113gr. Remember not to use curry sauce which they already added in coconut and as many as 20 ingredients inside. When you slightly shake the jar they are very watery, I avoid them at all cost. 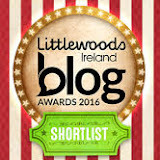 I used Thai Gold brand from SuperValu. These two brands are Thai brands from Asian shops. 1 and 1/2 table spoons Thai red curry paste. 1 cup mixed red and green or yellow peppers. 2 cans coconut milk 400ml ( I used the full cream, I often shake them and if they don't sound watery then I will pick it). 6 lime kaffir leaves( optional). Palm sugar and fish sauce to taste. 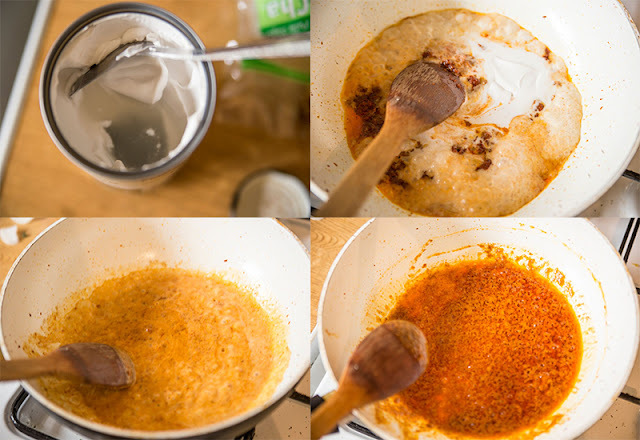 In a hot frying pan, add 2 table spoons cooking, heat up and add curry paste. Fry for few minutes until the fragrant flavour is released. Add in all the cream of 1 can of coconut milk ( floating on top and I discard the water at the bottom) and boil the mixture for about 2 to minutes in medium heat until the oil separated. Add the chicken. Bring to boil and cook for 2 minutes in medium high, add all the sweet corn, peppers, mushroom, aubergine. Bring to boiling again. Add in 2 table spoons fish sauce, 1 full table spoon palm sugar to taste and cook for 2 minutes until the veggies becomes slightly soft. Taste again to adjust the fish sauce and sugar. Add in basil and grapes. Turn off the heat and it's ready to serve.